Halloween is special time when we are allowed to reveal parts of our psyche to the general public without fear or shame. Some people take this holiday quite seriously and work on their costume for weeks. Others think of it as a casual reason to have fun and rent a costume or buy something on sale at a store. There might be plenty of old stuff around the house with which to make a clever costume and some budget-conscious do-it-yourselfers get creative with this option. Whatever the circumstances that bring together a Halloween costume, the psychic energy the inner self is likely to be revealed. Walking out in public in costume is a way to let the world know you more intimately. 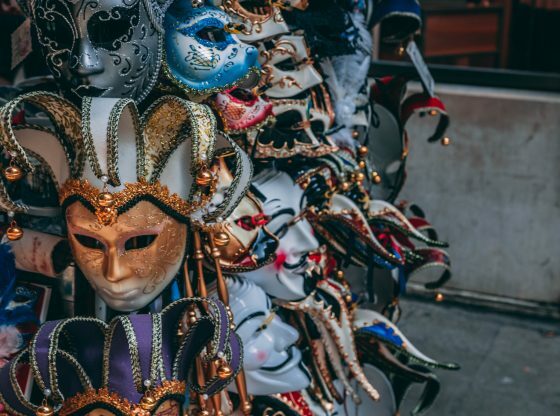 Connecting with the person behind the persona is easier when everyone acknowledges each other’s masks. When you encounter an interesting person at a Halloween party, his or her costume is the natural starting point to begin a discussion. Many socially introverted people who would make great life partners avoid group gatherings. The advantage of attending Halloween parties is that your costume gives you an excuse to have a conversation and a chance to get to know an otherwise socially timid person. As you chat with an attractive trick or treater, you must tune in on a psychic level to learn whether this person is really a match. A deeper study of the costume can open psychic sentiment. A person dressed as a vampire probably is not interested in sucking your blood. What this costume reveals is a desire for elegance. On a psychic level, you will feel connected to a person in a vampire costume if you are drawn to the finer things in life. A werewolf costume is an invitation to physical exploration. Does your animal side want a partner in crime? Doctor, nurse, mad scientist and other professions that combine status with intellect make for costumes that reveal an interest in trivia and life’s fascinating details. Intrigued? Find out what this person does for a living in real life. You may have discovered their secret longing for cerebral and physical companionship. Analyzing someone’s Halloween costume choice is not the only way to tune into their deep, true self. Consider the dominant colors. Blacks and Whites represent concrete notions about the way the world works. Even if he or she is wearing a grotesque zombie mask, this person perceives the world in a grounded manner. If you are pulling this sort of person toward you, look for Halloween to leave a treat in your heart. Reds, Oranges and Yellows reveal passion for living in the moment. If you have been a little bored lately, this is the sort of person you may attract. The payoff for you will be far more exciting than the status quo. Blues, Purples and Greens give you ample psychic space to see whether someone is healthy emotionally. These revelatory colors open the doors of transparency between you. As a result, you may be overwhelmed, frightened, disgusted or, maybe, fall in love. Tune in with your psychic senses at the right moment and find out. Don’t overlook texture, an important part of every Halloween costume. A costume that invites tactile interaction tells you this person is comfortable sharing intimate moments. But will intimacy be exclusive? Is this person looking for a monogamous relationship? Pay attention to what your instincts tell you. Shiny satin and crushed velvet may be worn by someone interested in distinct boundaries. Netting or fishnet reveals a desire for permeable realities. It’s possible this person may not define their relationships as existing within a space of sacred trust. Touching someone’s textured costume lets you perceive with your sixth sense. Is it a comfortable sensation of one-on-one mutual respect, or are you feeling a tugging and repelling energy that seeks immediate gratification? Be present to your feelings when you embrace the invitation to touch. This method of sharing psychic energy is often taboo, so enjoy yet another Halloween gateway to psychic exploration. You may discover your soulmate in costume when you are approached, rather than vice versa. Your costume will attract certain people who are part of your larger psyche. Remember some practical advice from beyond the psychic sphere: a comfortable costume will allow you to get in touch with your own connection to psychic energy. Free movement and the ability to smell, hear and see inform your cosmically connected senses. Embrace the fun inherent in this holiday and you might end up with a life partner in and out of costume!